Castle Howard near York, one of the premier stately homes of England, is situated in the Howardian Hills, an Area of Outstanding Natural Beauty.. 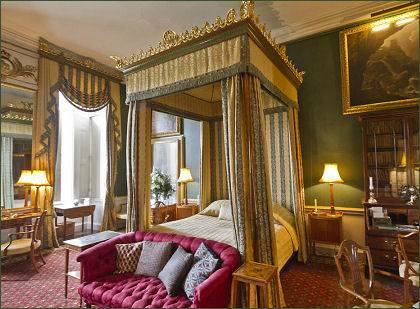 The baroque eighteenth century masterpiece was designed by Sir John Vanbrugh for Charles Howard, 3rd Earl of Carlisle. Castle Howard occupies the site the ruined Henderskelfe Castle, which had come into the Howard family in 1566 through the marriage to Lord Dacre's widow of Thomas, 4th Duke of Norfolk. Building of Castle Howard began in 1699 to a design by Sir John Vanbrugh for Thomas Howard's descendant Charles Howard, 3rd Earl of Carlisle. 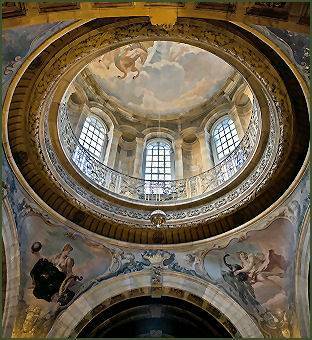 It took more than a hundred years to complete Castle Howard, but the bulk of the work was carried out between 1700 and 1710. The most dramatic feature of the building is the impressive central dome, a bold structure that had never been used to crown a private dwelling in England before. 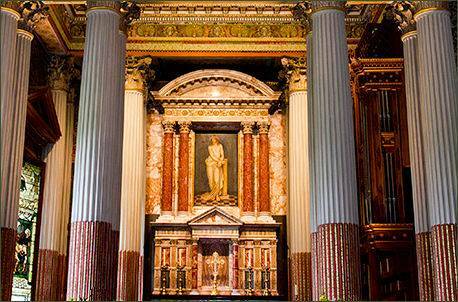 Work continued for another century, the building was only fully completed in 1811. On the 9th November 1940, the southeast Wing of Castle Howard caught fire, spreading quickly into the Great Hall, the dining room and the state rooms on the east side and the central dome were all destroyed. George Howard rebuilt the dome in 1962 and the building was eventually restored. The Garden Hall was rebuilt in 1981. 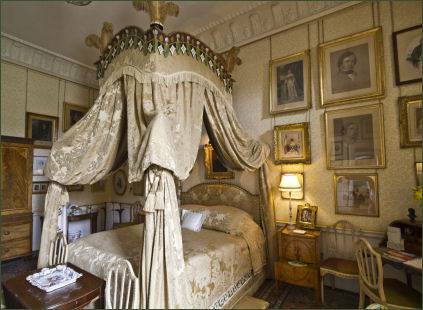 It remains home to the Howard family to the present day and visitors can discover dramatic interiors containing world-renowned collections. The 1,000 acre grounds and parkland. The gardens at Castle Howard are extensive. A large formal garden stands immediately behind the house. The house is prominently situated on a ridge and this was exploited to create an English landscape park, which opens out from the formal garden and merges with the park. Two major garden buildings adorn this landscape, the Temple of the Four Winds at the end of the garden, and the Mausoleum in the park. The Howard family of Castle Howard descend in the male line from Thomas Howard, 4th Duke of Norfolk (10 March 1536 - 2 June 1572), a matetrnal cousin of Queen Elizabeth I who was executed for his part in the Ridolfi plot in which he plotted to marry the Queen's cousin Mary Queen of Scots. 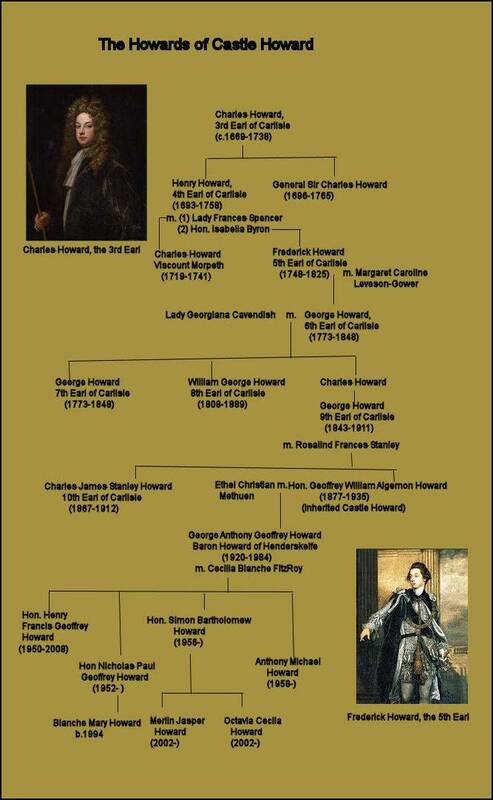 Norfolk's second son, Lord William Howard was the great grandfather of Charles Howard who was created Baron Dacre of Gillesland, Viscount Howard of Morpeth, and 1st Earl of Carlisle on 20 April 1661 His grandson was Charles, third Earl of Carlisle the builder of Castle Howard. The first earl was a statesman. He inherited his title on the death of his father Edward Howard, the 2nd earl in 1692. He was elected as MP for Morpeth in 1689. He was appointed Governor of Carlisle from 1693 to 1728 and Lord-Lieutenant of Cumberland and of Westmorland from 1694-1714. King William III made him a Gentleman of the Bedchamber between 1700 and 1702, First Lord of the Treasury from 1701 to 1702 and Privy Counsellor in 1701. He acted as Earl Marshal between 1701 and 1706 because his cousin, the Duke of Norfolk, was a minor. Charles, the first earl was succeeded in the title by by Henry Howard, his third but eldest surviving son. Henry was elected to the House of Commons for Morpeth in 1715, a seat he held until 1738 when he succeeded his father and entered the House of Lords. 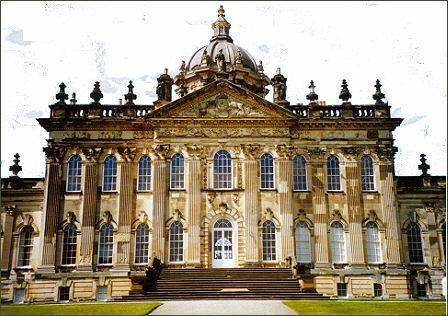 He continued the building of Castle Howard commenced by his father to the designs of his brother-in-law Sir Thomas Robinson. The 4th Earl's eldest son Charles Howard, Viscount Morpeth (b. 1719) served as an MP but died of consumption in 1741 before his father. The title passed instead to his younger half-brother, Frederick Howard (1748-1825), who became the 4th Earl of Carlisle. 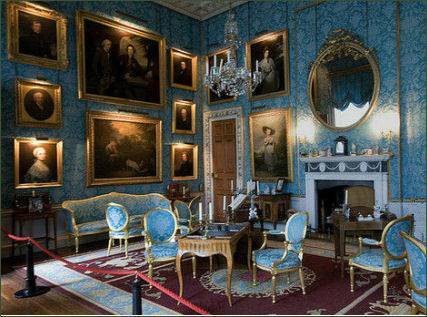 Frederick was one of the syndicate who bought the Orleans Collection of paintings, many of which remain in Castle Howard. In 1791 he opposed William Pitt the Younger's policy of resistance to the dismemberment of the Ottoman Empire by Imperial Russia, but on the outbreak of the French Revolution he left the opposition and vigorously maintained the cause of war. The title eventually passed to his eldest son George Howard, the sixth Earl, who married Lady Georgiana Cavendish (1783-1858), daughter of William Cavendish, 5th Duke of Devonshire and the infamous Lady Georgiana Spencer in 1801. Howard was returned to parliament for Morpeth in 1795, a seat he held until 1806 and then represented Cumberland until 1820. In 1806 he was sworn of the Privy Council. Two of the fourth earl's sons inherited the title in succession, George Howard, the seventh Earl ( 1802- 1864) and William George, eighth Earl of Carlisle (1808 - 1889), who was Rector of Londesborough in the East Riding of Yorkshire from 1832 for more than forty years. The 8th earl died childless and was succeeded by his nephew George James Howard (1843 – 1911), who became 9th Earl of Carlisle, a talented painter and a friend and patron of a number of the artists of the Pre-Raphaelite Brotherhood, being particularly close to Edward Burne-Jones. 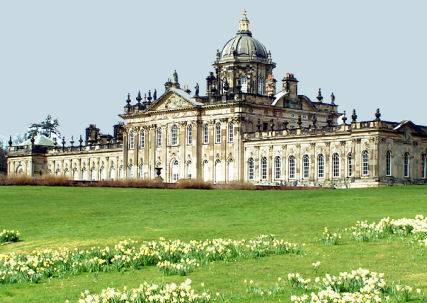 George was the last Earl of Carlisle to live at Castle Howard. The 9th Earl of Carlisle's fifth son, Geoffrey William Algernon Howard (1877 - 1935), a Liberal politician inherited Castle Howard on the break up of his father's estates , while the title passed to his elder brother Charles James Stanley Howard (1867 - 1912), became the 10th Earl of Carlisle.